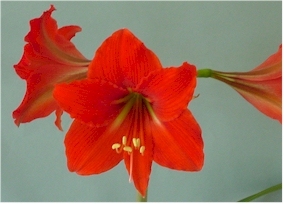 want your Amaryllis bulb to bloom at a preset time (e.g. winter holidays). Read our special care instructions for dormancy. LIGHT: keep your Amaryllis, indoors, in the brightest window that you have, over the winter months. A greenhouse, of you have one, is great as well. TEMPERATURE: Move your Amaryllis indoors in the fall when night temperatures fall to about 50°. Once indoors, keep them at normal room temperatures. Bulbs which lose some of their leaves or seem to slow down considerably, should be moved to cooler spots if possible (60-65°) until they resume more active growth. The rest can be kept at normal household temperatures. WATER: As it near the end of summer, growth starts to slows down as the days get shorter, and the nights cooler. Start reducing the frequency of watering as plants will not require as much. Remove older leaves as they fade. FERTILIZER: Reduce fertilizer application in winter, perhaps to once a month, or slightly more if your plants are more vigorous. Always use a flowering plant food. When your plants begin to show signs of new growth and vigor with brighter light and warmer temperatures in the spring, increase watering. You may also wish to repot your bulb at this stage, before any flowers emerge! Plants should then begin their blooming cycle again.